Nick Kondos (Kontopoulos his father was born but uncomfortable with his birth name he changed it so he can “mix good”.) was itching for the fight. His mother was not. She was simply afraid. She had one son and a married daughter, a lawyer with no children of her own. His father? That’s where he drew the line on national chauvinism and on mixing good. But Nick was itching for the fight and joined the marines. And the next time he came home was all smiles and proud to be in uniform. Finally an American. Even his father smiled. A bitter smile. But his mother wailed and had him as good as dead. And his sister, a down to earth career woman commented on the mercenary army, like in the old times with their ancestors, hired by the Persians to kill and be killed for pay. So he shipped out with his Unit. From Camp Lejeune to Al Asad. They laughed and joked on the plain ride over there. They talked about the ragheads, all of them itching for the fight. They were well equipped. 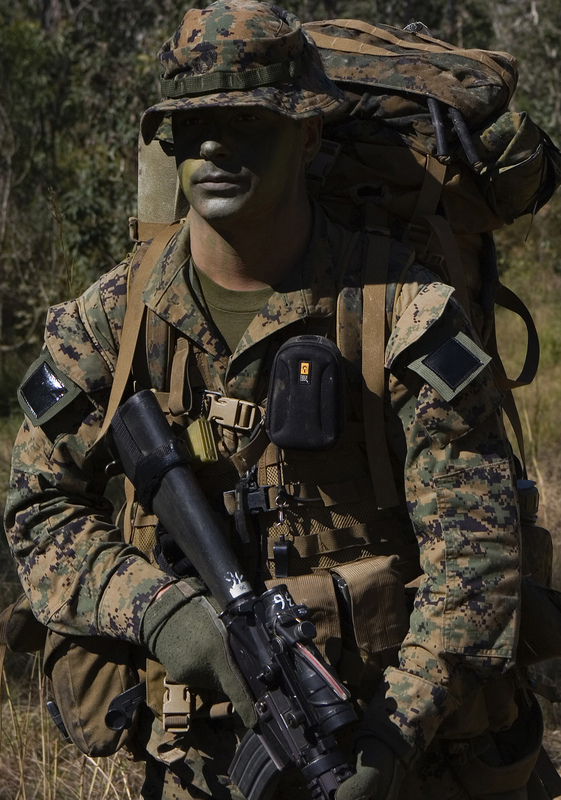 With their ILBEs in MARPAT and interceptor body armor. Complete with ECVCHs, SAPIs, MTVs and OTVs and FROGs. With their infrared goggles and night vision devises. With their weapons cleaned and well oiled, their M16A4s and M1014s and pistols and knives on the ready. Itching for the fight. They carried hand grenades, fragmentation and incendiary, with M203s and MK19s and M32s. Armored trucks came to transport them to their forward bases. They loaded up all smiles in spite of the intense heat. They teased each other on the way as the passed galabiya clad peasants and shoeless children playing in dirt streets and pointed rifles at them in jest pulling on their triggers and pow pow-ing, and itching for the fight. They sang like they had done at training camp. Shameful songs really. How they were there to kill. To get into their schools and their mosques and wipe them all out. They felt the daggers of hatred in the peasant’s eyes as they passed them and they were excited for they were ready and itching for the fight. They weren’t gone but a few miles from Al Asad. Maybe 30 or so when the first armored truck was blown up into the air by a few sticks of dynamite, by an IED. And then another and another. Nick was in that third one. He barely had enough time to look at the stumps that were once his legs and at his pelvis now a gaping bloody hole. He did not hurt, just a bit surprised. The last thoughts in his mind were about heroes. About his folks and his neighbors back in Chicago and about a public funeral and many orations. His mamá, she had prepared for this moment and was dry eyed and stone faced. But his babá wailed and was inconsolable. And he cursed a lot raising his arms to the sky. God, the military, his fate, the Iraqis. There was no ceremony, no pomp about the fallen hero. Against government and military policy they said. Just a simple funeral service in the Greek Orthodox church for a dead boy, and a burial. His father refused to drape the flag over the casket. Everyone was downcast. Some said how there was no respect by the young about their elders any more, and how all this could have been avoided had the boy listened to his father as he should have.